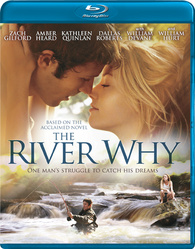 The fly-fishing drama based on the best-selling novel is planned for Blu-ray in November. In an early announcement to retailers, Image Entertainment says 'The River Why' will have a Blu-ray release on November 8. For many, fly-fishing is the ultimate exercise in tranquility, a chance to commune with Nature on its own terms. But for 20-year-old Gus Orviston – “the Mozart of fly-fishing” -- it represented the ultimate albatross between his father and living his own life. And sometimes, you have to run far away...so that you can come to your true self. Based on the phenomenal best-seller byDavid James Duncan with over 500,000 copies sold, and boasting an all-star cast including Academy-Award™ winner William Hurt, Amber Heard, Kathleen Quinlan, Zach Gilford, Dallas Roberts and William Devane, 'The River Why' is directed by Matthew Leutwyler and is set in the breathtaking wilds of Oregon. The Blu-ray will feature 1080p video, a DTS-HD Master Audio 5.1 soundtrack, and supplements include interviews with cast and crew. You can find the latest specs for 'The River Why' linked from our Blu-ray Release Schedule, where it's now indexed under November 8.